Taming of the Shrew actors, from left, Suzanna Laine, Lily McCluskey and Charlie Beaver rehearse at Mouat Park. ExitStageLeft Productions and Graffiti Theatre will build on a tradition of bringing Shakespeare to Salt Spring’s outdoors in the summer with a staging of Taming of the Shrew opening at Mouat Park on Thursday, June 28. If the story of a man breaking a spirited woman into a compliant wife feels like an off-note during the #MeToo era, that note may seem even more off-key considering the play is brought to audiences by a company led by two strong young women. But director Jeffrey Renn’s reverse-gender casting and unique setting in the historic Wild West are providing the “twist” that has the company engaging directly with the global campaign against traditional power dynamics — all the while respecting the play’s comedic provenance and its masterful playwright. Taming of the Shrew will mark Renn’s third collaboration with exitStageLeft, the company founded by Christina Penhale and Jekka Mack. “It’s always an exciting proposition, because we can mold the play to what we want to tell and how we want to tell it. And we’re always very inspired to work with Jeff because he’s so full of integrity and love,” Penhale said. Renn brings decades of experience as an actor, director and teacher who has anchored plays from Stratford to UVic. His work as a director builds on expert knowledge of the source material, but often features new presentations that illuminate continuing connections and social relevance. Penhale said she and Mack were surprised by Renn’s 2018 play suggestion at first, but were soon won over by his treatment of the famous comedy. Renn’s career in the Canadian theatre world included the chance to join Toronto’s famous Soulpepper company, which has been recently rocked by sexual abuse allegations against its founder. His motivation in taking on the theme is to address that power system, but not to shame or condemn anyone. “We can recognize this is how we are, and that we can make different choices,” Renn said. Noting that the Taming of the Shrew is one of a half-dozen Shakespeare plays that are still reliable hits to this day, Renn said it’s important to question why that is. ExitStageLeft tells the story of Petruchio’s eventual dominance over Kate, and the parallel wooing of her younger and more compliant sister by three suitors, in two innovative ways. The reverse casting mechanism gives Penhale the male protagonist’s role and puts 16 other women on stage with her as male characters. The three female characters are played by young men, who are all around 20 years old or younger. Charlie Beaver is appearing as Kate, returning to Salt Spring after a year at Langara’s Studio 58 theatre program. Renn said Beaver is hungry to grow as an artist and is reaching past his natural clown leanings for the role. Renn said Penhale and Mack are also maturing as artists and needed the challenge of better-written roles, and Penhale already conquerred “the female Hamlet” of Shakespeare parts when she played Rosalind in As You Like It last year. As Penhale explained, her role as Petruchio has indeed been tough — the hardest one she’s faced so far. “Petruchio is not a total villain, but we can’t make excuses for his actions. It’s a very challenging situation,” she said. The second device is the Wild West setting, which removes the story in time to permit a break from the naturalism that modern theatre dictates. The commodification of women is prevalent, and there are similar stock character types as would be familiar to Shakespeare’s audience. 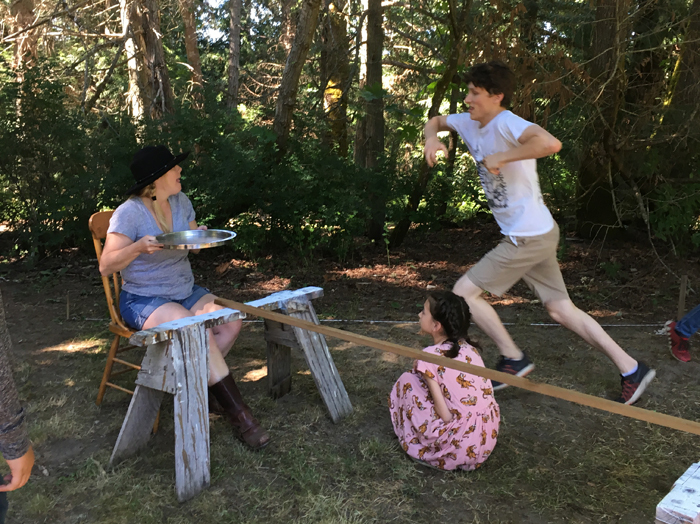 The play runs June 28, 29 and 30 and July 5, 6 and 7 in the Mouat Park meadow beginning at 7 p.m., with gates open at 6 p.m. and a Wild West-themed sing-along and picnicking at 6:30 to set the mood. There is also one matinee show at 2 p.m. on July 7, with gates at 1 p.m. and sing-along at 1:30.